From far and wide they came, representing different backgrounds and experiences—all to pay homage to one newspaper and its impact on the Hellenic community. 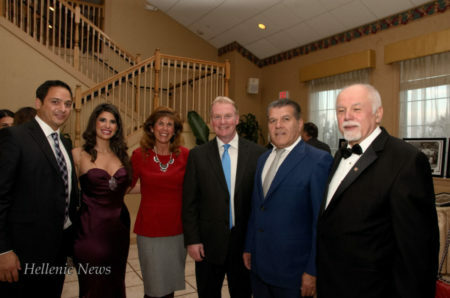 This was the 29th-anniversary celebration of the Hellenic News of America, a gala event Sunday, Oct. 30, at the Concordville Inn in Concordville, Pa. 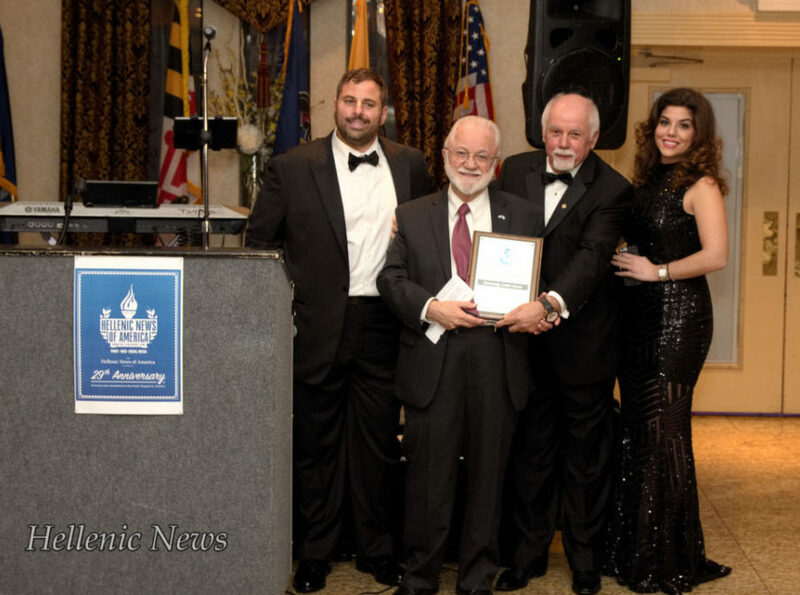 Guests were treated to a lavish reception and dinner and the evening was peppered with speakers and an awards presentation honoring six outstanding Greeks and Greek Americans. Music and Greek dancing rounded out the evening. 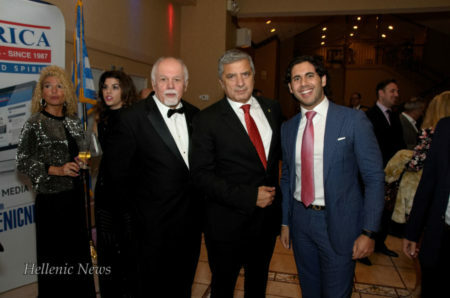 There was warm praise from all corners—the medical society, politicians, business owners and community leaders– about the bi-lingual newspaper’s successful role over the years in uniting, informing and promoting the Greek American community. “I feel the newspaper connects the American culture with the culture I came from as well as the history,” said the newspaper’s cultural affairs correspondent, Lilli Bita. The Greek-born author and actress has been covering cultural events and interviewing celebrities for Hellenic News since meeting the newspaper’s founder, Paul Kotrotsios, 30 years ago after moving from Miami to Philadelphia. Part of her role, she said, is to connect women in Greece and women in America. “I like to connect everything, to let American women know what Greek women are doing,” she said. The newspaper’s success in connecting people seemed to be a recurring idea from those attending the dinner. 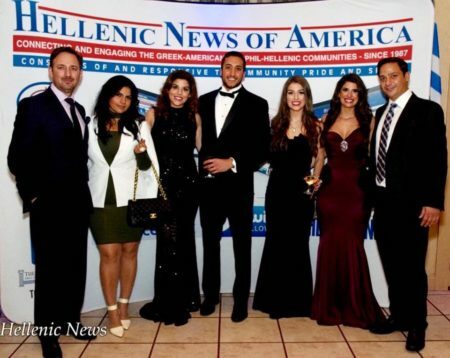 Hellenic News of America was founded in 1987 and successfully filled a void in the Greek community, giving them a voice, linking the Greek communities together. 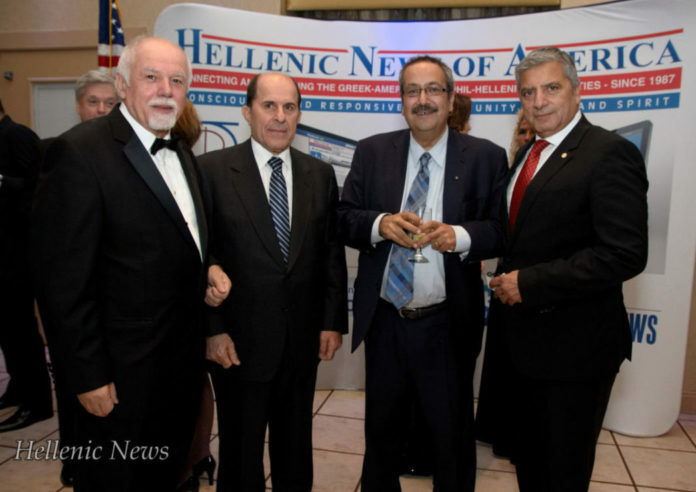 CPA Dean Laskaris offered his congratulations to the Hellenic News of America. 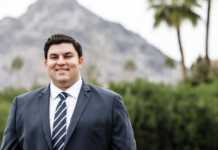 Laskaris is owner of Laskaris & Laskaris in Wayne and also serves as a member of the parish council of St. Sophia Greek Orthodox Church in Valley Forge. Georgia Chletcos, a financial advisor, was proud of Paul and his wife, Linda, for their long years of service to the community. Growing up in a family that runs a Greek newspaper spanning the mid-Atlantic region, providing international coverage, was anything but ordinary. So says Hellenic News co-publisher Aphrodite Kotrotsios. Publishing is a tough business, getting on the phone, talking to thousands of people, organizing events, meetings, seminars, expos. “I may be bias now because I’m talking about my father and mother, but I have to acknowledge their determination to create something out of nothing,” she said. “He latched on to the Hellenic community. And people wanted to be represented,” she said of her father’s efforts. The people also wanted to hold on to their Hellenic heritage and traditions. “Just the way that Instagram and Facebook represent a need for individuals to share a piece of themselves with mainstream society, the Greek people wanted to be organized…as a community, making a grand entrance to society with the Hellenic News of America,” she said. 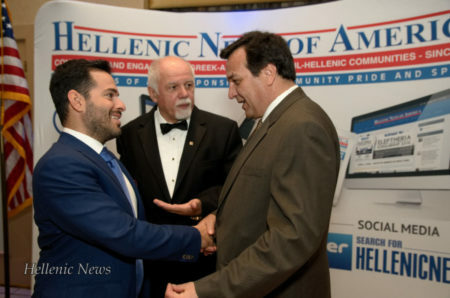 Beyond its role as a monthly newspaper, Hellenic News has helped Greek American and non-Greek American businesses grow. Charles Fulforth, owner of Airborne Data Imaging Group, Inc. in Fort Washington, has been working with Paul and the Hellenic News for about a year. Fulforth said Paul is also helping him export the device, a multifunction cardiogram, to Greece. The non-invasive test will tell you in 10 minutes 26 different conditions that may be going on with your cardiovascular system, he added proudly. Bob Keares of Keares Electrical Contracting, Inc. out of Chester County, has been part of the Hellenic News for about 25 years. His electrical contracting business serves the tri-state area and the newspaper provides a good vehicle to reach customers. And while he loves getting the paper delivered at home, he supports the newspaper’s mission to go digital. “I think for the younger generations, we’ve got to get to the digital stuff. I think Twitter [to them] is more appealing,” he said. Steven Guy of National Gas and Electric has only been advertising with Hellenic News for about a month but likes what he sees. “I think it’s fantastic. They’ve been very helpful in the outreach for us to reach…the Greek community,” through their website, the newspaper and other ways, he said. 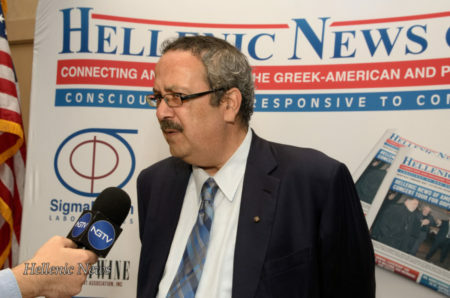 Hellenic News of America has also played a pivotal role in bringing news from Greece to America and to expand on the culture and politics of home. Dr. Anthony Skiadas kept things moving as master of ceremonies at the celebration while guests dined surf and turf in the gold ballroom of the Inn. The second generation Greek American is the owner of Smilebuilderz, a dental campus in Lancaster. “I was very honored and at the same time nervous,” he told the guests. But then he realized he was at a Greek function. “At Greek functions, people speak amongst themselves so no one would be listening anyway,” he joked. 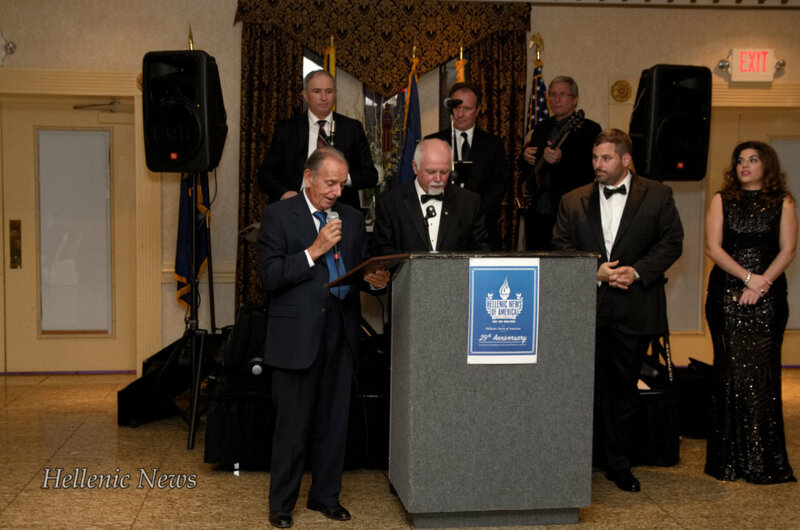 After acknowledging those dignitaries that had traveled from Greece to attend the celebration, Dr. Skiadas presented a who’s who list of attendees at the dinner. The 29th anniversary event guest list included Dr. Spiro Spireas, Ph.D., chairman and CEO of Sigmapharm Laboratories; Father Peter Thornberg of St. Sophia Church in Valley Forge; Bill Matarangas, president of the Hellenic American National Council; Dimitri Hios, first vice president of the Hellenic American National Council , Chris Christakis, second vice president of the Hellenic American National Council; Kostas Hatzistefanidis, treasurer of the Hellenic American National Council and past president of the Pan-Macedonian Association; Sandy Tzaferos, PharmD, president of the Hellenic Medical Society of Philadelphia; Ted Tsafatinos, auditing committee member for the Hellenic American National Council; Dr. Panagiotis Baltatzis, secretary for the Hellenic American National Council; the Honorable Jack Whelan, district attorney for Delaware County; and Stavroula Kotrotsios, assistant district attorney for Delaware County, Evangelia Manos, assistant district attorney of Philadelphia, Jude Conroy, assistant district attorney of Philadelphia, George Maniatis, vice president of the Federation of Hellenic Societies of Philadelphia, George Marafatsos, President of the Pan Laconian Federation, George Zapantis, Vice President of the Hellenic American Chamber of Commerce. 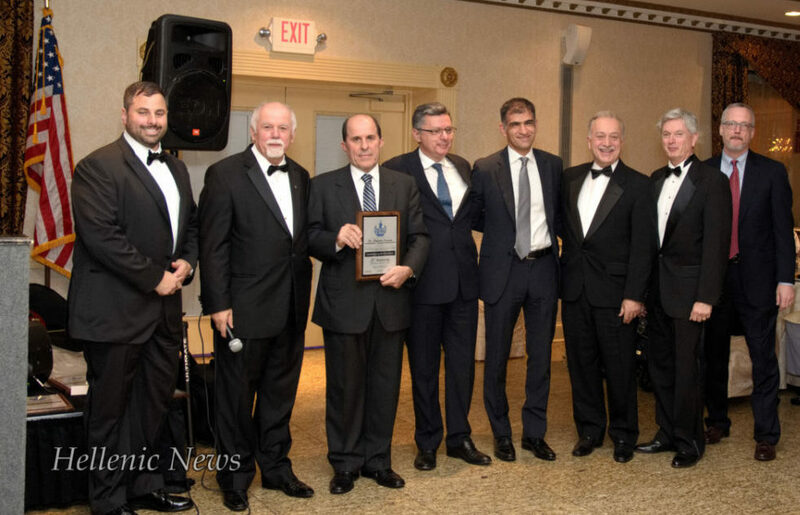 A key part of the evening was devoted to six award winners, Greek or Greek Americans recognized in their particular fields for outstanding achievements and for their contributions to the Hellenic communities. Dr. George Patoulis, who came from Greece to attend the dinner, received the Leadership Award for his leadership role in government. Dr. Patoulis is president of the Medical Association of Athens, president of the Central Union of Municipalities of Greece and Mayor of the Municipality of Amaroussion. The medical society was well represented at the dinner. 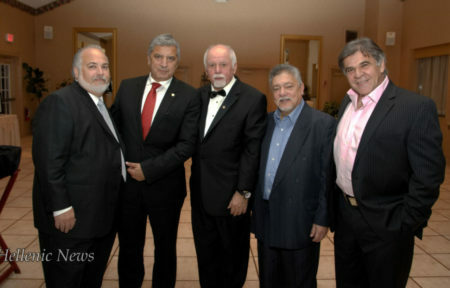 At one point, up to 20 physicians, including five other cardiologists, posed with Dr. Plestis for a photo. Elias Tomazos, director of the PAIDEIA Hellenic Organization, University of Connecticut, was honored for his work building a community center for Greek students at the University of Connecticut, as well as his work on a Greek Orthodox chapel and an authentic Greek open-air amphitheater on campus. The theater is unique in the western hemisphere and the only one outside of Greece. Tomazos was at work on the projects and could not attend the dinner. His daughter Loukia Tomazos Agapis and his son-in-law Dr. John Agapis received his award on his behalf. “Mr. Tomazos is working, despite the fact that it’s raining, with the architects. 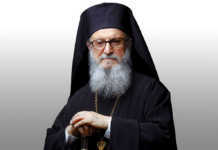 He’s going to be there until late tonight to finish up,” explained Paul Kotrotsios. 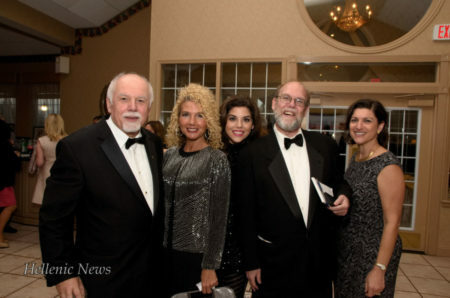 Eleni Poulos, owner of Eleni Tours in Broomall, received the Hermes Award for fostering travel to Greece. A native of Greece, she likes to promote travel there and offers unique insider information to her clients about what to see and do when visiting. Travel to Greece has been very popular this year, she added, because of the strength of the dollar and because Greece is a beautiful country with a rich history. “Dr. P. has always inspired me personally to be great and I’m ever grateful for his positive influence,” said Dr. Skiadas, continuing his role as master of ceremonies. “I’m a humble family physician.” Dr. Patukas said modestly and then went on to praise the work of Paul Kotrotsios, who he has known for close to 40 years. A separate award was also given Theodore Tsafatinos for his steady performance and success in the Hellenic Federation and for helping establish Greek charter schools in the United States. Dr. Spiro Spireas, chairman and CEO of Sigmapharm Laboratories, LLC, and a strong benefactor for Hellenic News of America congratulated the honorees. “You guys are above and beyond in your fields and it’s an honor to be in the same place with you. It’s fortunate for Greeks and Greek-Americans to have people like you eating together with us,” he said. Dr. Spireas then talked about the 29th-anniversary celebration. Athanasia Papatriantafyllou, of the Greek Press Office in New York City, said it was a significant accomplishment that the Hellenic News of America had survived 29 years. “My wish is to see the newspaper after 100 years,” she said. Dr. Skiadas closed the award ceremony by reading a poem, written in Greek, called “Success.” It was written by a young Greek-American author in 1917. “When I read the poem I think about my parents and my grandparents who left their village in Greece and everything that they knew and all that they had to come to the United States. Now having three children of my own I understand the power of motivation behind the desire to build a better future for those we love despite whatever obstacles you face,” he said. Today, we have an obligation to keep a rich Greek heritage alive, he said. “The bottom line is that there is power in numbers. It’s time to get involved and even by contributing something small or reaching out to give to somebody else involved, these efforts make a big difference. The evening’s host, Paul Kotrotsios, gave the final remarks as the ceremonies ended and the dancing began. 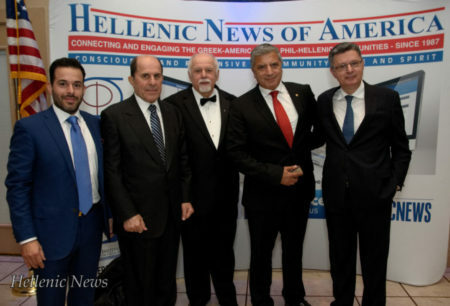 “For 29 years, Hellenic News of America continues to be at the forefront, promoting Hellenism in America with innovative ideas, educational information, and networking events,” he said. “The Hellenistic principles and ideals that shape our heritage continue to ignite our flame in preserving our heritage here in America. 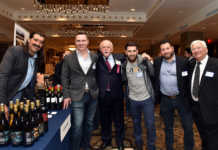 “Most recently, we organized several fundraisers across the East Coast through the Mid-Atlantic Greek American Foundation… and raised funds specifically for the elders and the orphanages in Epirus, Greece. 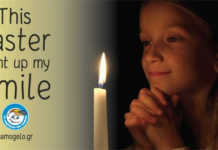 “This year, we are helping a major non-profit from the greater Philadelphia area. In addition, a scholarship fund has been formed to assist the students with their studies,” he said. “The Hellenic News of America is more than a newspaper, ladies and gentlemen. Over the years, we have cultivated a family of readers, supporters, advertisers, and subscribers. Without your support and involvement, it would be hard to tackle this immense responsibility that we have undertaken. 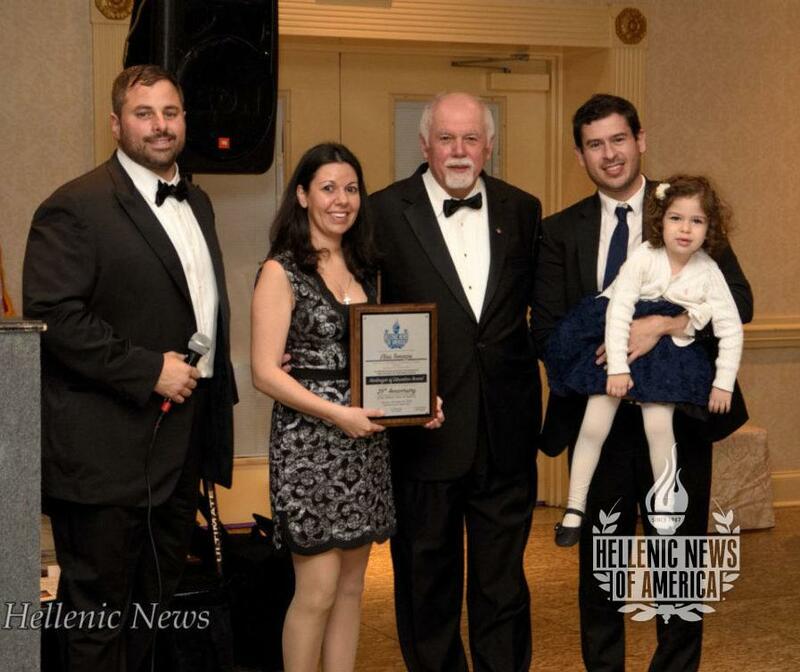 Efforts are continually needed to make the Hellenic News of America sustainable to help Greek American communities for the next 30 to 50 years.